I finally decided (I mean, it IS December!) to use a colorful charm pack that I had on hand. It is Mormor by Lotta Jansdotter for Windham Fabrics. 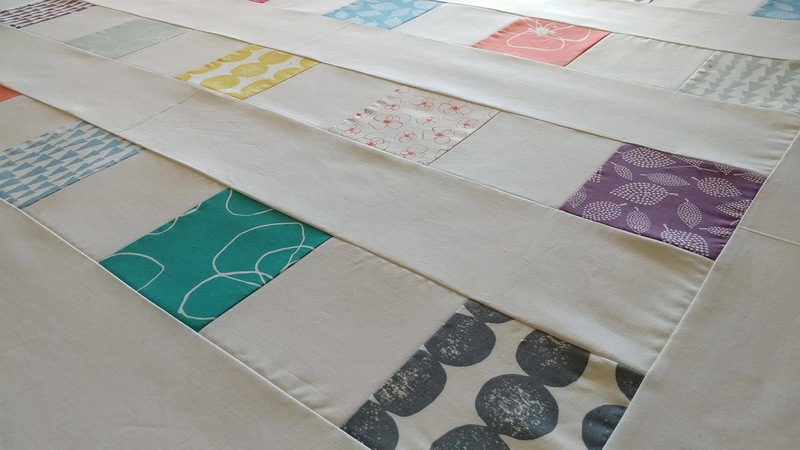 I cut 5" squares from my bolt of Moda Bella 98 White that I keep on hand, and sewed five color squares and four white squares together to make each row. 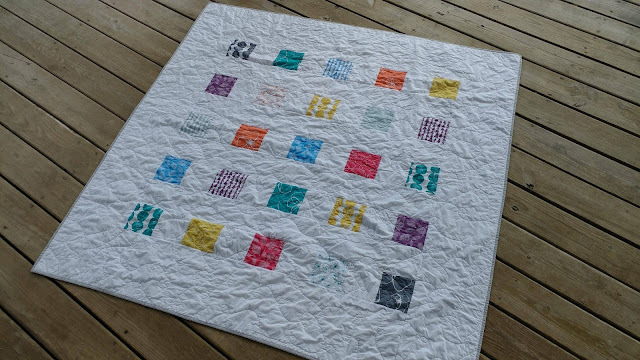 I sewed a 5" wide strip between each row then added a 10" border around the whole top. 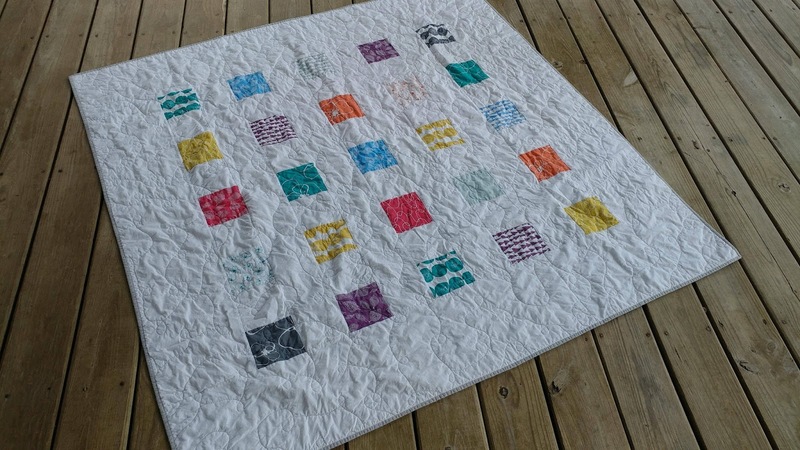 This made a 60" square quilt - with just 25 charm squares! I pin basted the quilt on our dining room table using 108" wide backing called "Widescreen" by Carolyn Friendlander for Robert Kaufman Fabrics in Desert Green (which really is more of a light gray color) and 80/20 batting from The Warm Co. I just bought the wide back fabric a couple weeks ago just to have on hand because I never have backing fabric when I finish a quilt. Well, now I don't have any again! 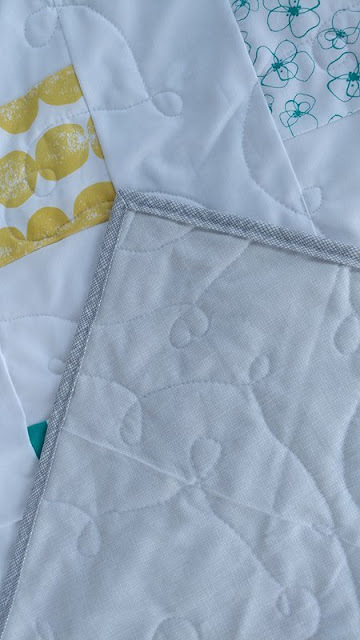 I used my Juki TL-2010Q to free motion quilt loops using 50wt Aurifil thread in White #2024.I kept the loops fairly far apart, maybe about 3" between lines. This is one of my go-to designs. It's quick and forgiving! 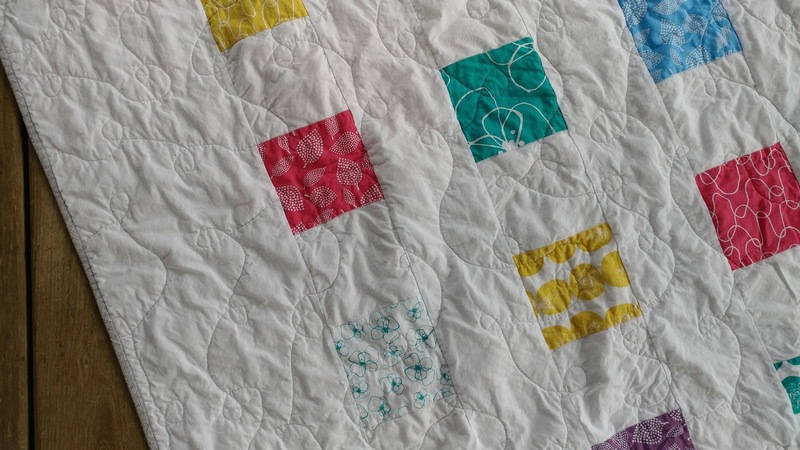 I quilted it while my boys were playing out in the yard on a 60 degree day (yes, in December!). I could watch them right out the window while I was quilting! For binding, I used another Carolyn Friendlander "Widescreen" print. This time in Gray. I used 2 1/4" strips and machine stitched it on. I discovered when searching through my stash for binding fabric that I mostly keep fat quarters, but rarely have 1/2 yard or larger cuts that I can use for binding. I need to start collecting some yardage for bindings! Usually, I don't wash a quilt before gifting, especially if it's a baby quilt. 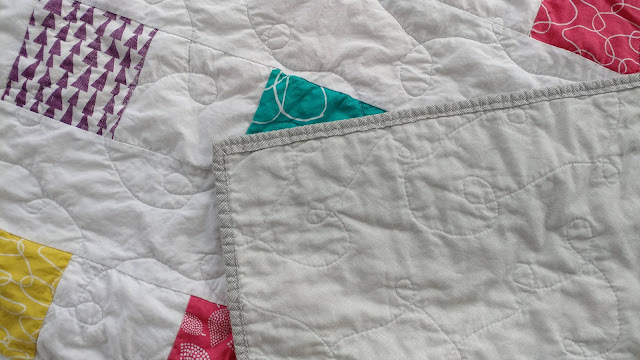 I usually include a few color catchers with washing instructions, and include a note about wanting the quilt to smell like "mom" and not like me! When I received baby gifts with my boys, I would always wash everything even if the person said it had been washed. You just want everything to smell like you! However, since I do not know the recipient this time, I felt more comfortable washing it myself first. If the bright colors were going to bleed onto the white fabric, I'd much rather it happen to me before gifting than to the recipient! I only used two Color Catchers, and of course there wasn't any bleeding at all. 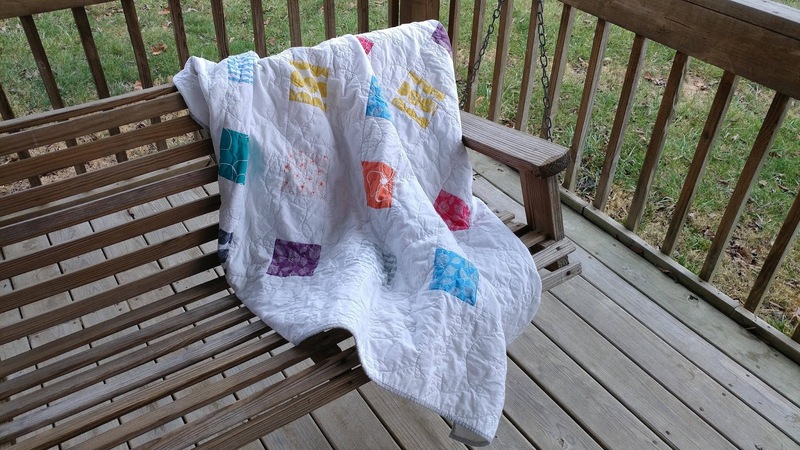 The quilt came out of the dryer all crinkly and warm! I added a label and packed it up right away so I wasn't tempted to snuggle with it! I can't wait for the box to be delivered! Have you ever done Pay It Forward gifts? I love keeping a secret and the anticipation of the surprise! Linking up with Finished or Not Friday at Busy Hands Quilts, Finish It Up Friday at Crazy Mom Quilts, and Can I Get a Whoop Whoop? at Confessions of a Fabric Addict. It's lovely, Laura! I've also discovered that I never have binding fabric on hand. 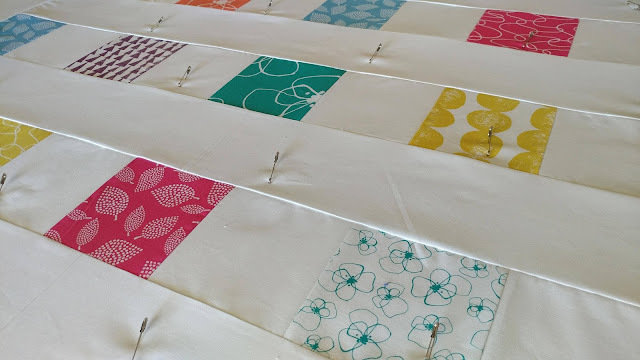 I love working with smaller cuts of fabric for a more scrappy feel, but I've decided that I need more half yards in my stash so I can pull out a binding when I need one. 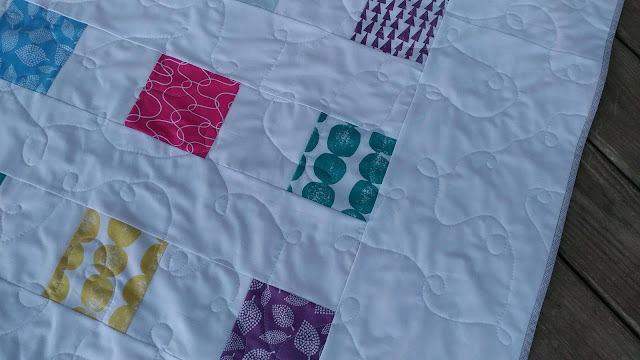 Though, sometimes I end up with a fun scrappy binding that I wouldn't have gone for if there had been yardage on hand. What a sweet gift, I am sure it will be a huge surprise and amazing treat for the recipient. 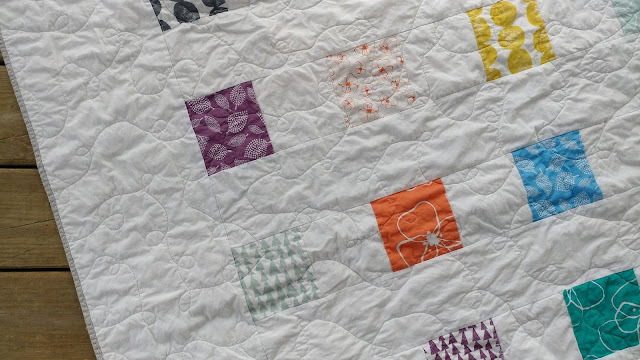 The weather is definitely crazy this year, but I'm guessing the quilt will come in handy for cozy holiday evenings! Oh it's so beautiful. 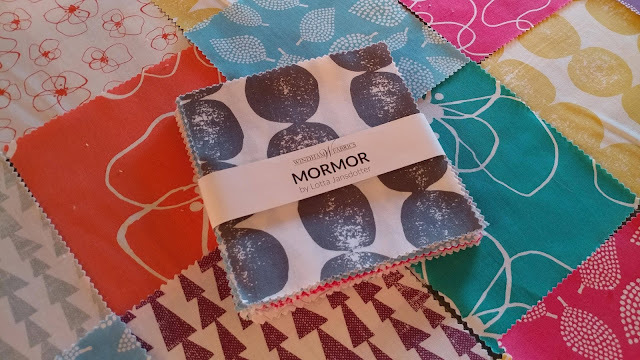 Mormor is such a beautiful fabric line, and I'm so happy to see it in a quilt! How clever to get such a sizeable quilt out of part of a charm pack by adding those sashings, It looks so clean and fresh and modern. It's a wonderful gift! Lovely idea to use for your PIF. 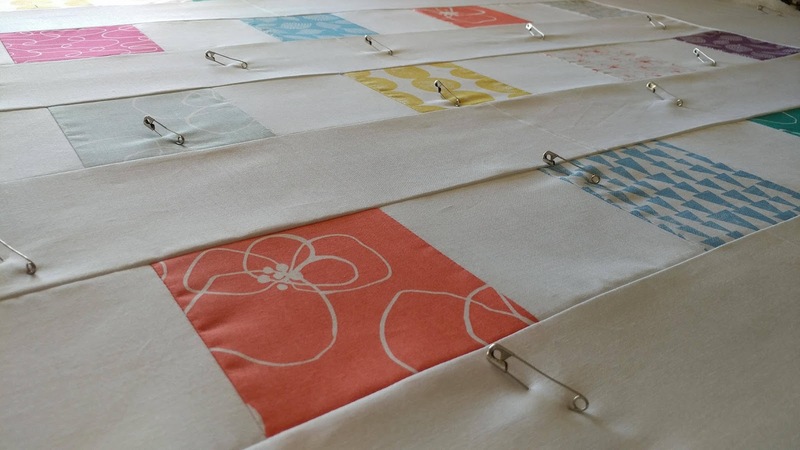 Great fabrics to use for a lovely finish. So nice & crinkly, soft and modern looking. I'm amazed that you pieced it in one hour! Someone is going to adore this quilt. Great job! 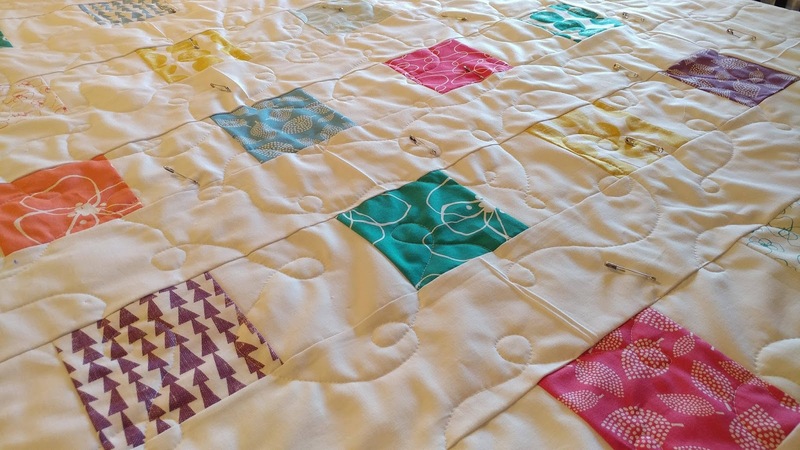 What a wonderful practice for your quilt sharing!! You are a good example to us all. I love your idea of nominating someone for your "Pay It Forward". What a wonderful surprise for a well deserving person. You put me to shame with your 47 finishes! Will you hit 50 by the end of the year? Merry Christmas!